Chef Jose Marte (second from right) with the team from Paila Y Leña Restaurant, which prepares exceptional Dominican cuisine, is one of the most popular dining stations at the Taste of Perth Amboy. High school students from the culinary arts program at Middlesex County Vocational H.S. earned the Second Place trophy in the Best Taste category. Shown on the right are Mayor Wilda Diaz and culinary arts teacher Stephen J. Moir. 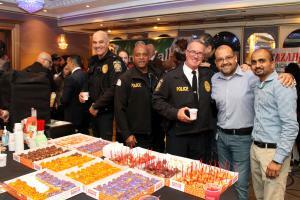 Perth Amboy Police Chief Roman McKeon (center) and his officers stopped by the Dunkin' Donuts display, sipped coffee and tasted the specialty-crafted donuts. The Taste highlights Perth Amboy's exceptional culinary style and the city's growing role as a destination for international cuisine in New Jersey. 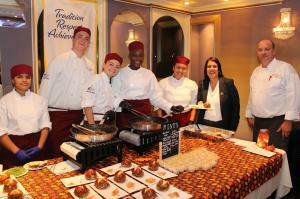 PERTH ABMOY, NEW JERSEY , UNITED STATES , October 25, 2018 /EINPresswire.com/ -- The spirit of Perth Amboy flowed through the more than 350 people who attended the City’s most successful Taste event on October 18. This is a record turnout for The Taste of Perth Amboy. A group of 20 restaurants, bakers and food artisans supported the 2018 Taste event, which was held aboard the Cornucopia Cruise Line’s St. Charles vessel. Local chefs, their teams, bakers, culinary arts students and a group of volunteers were busy preparing food and serving guests all evening. Enthusiastic attendees at The Taste sampled a variety of delicious appetizers, entrees, and desserts, and they sipped a variety of specialty beverages. The Taste is presented by the City of Perth Amboy and Mayor Wilda Diaz and sponsored by the Business Improvement District (BID). All proceeds from The Taste will be donated to Raritan Bay Area YMCA’s homeless initiative. The YMCA’s President and CEO Steve Jobin and Pastor Bernadette Falcon-Lopez, who coordinates the YMCA’s homeless services, thanked everyone for their generosity. Pastor Bernadette explained that earlier in the day she helped find temporary housing for a single mother with two children, who were without a home. Throughout the evening, the Taste of Perth Amboy’s judges – Ana Maria Zevallos and Douglas Dzema – visited each serving station. The judges sampled the cuisine or desserts that each restaurant or bakery prepared. The judges also reviewed each venue’s decorations, which enhanced the tasting experience. Many servers wore bright, colorful outfits or they were dressing in traditional clothing from countries in Latin and South America or the Caribbean. 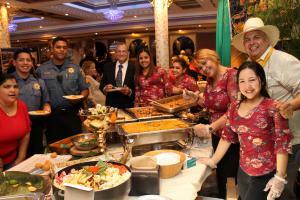 •	Best Taste: El Gran Valle Restaurant, 323 State Street; Culinary Arts Students, Middlesex County Vocational High School, 457 High Street; and Cornucopia Cruise Lines’ St. Charles Vessel, 401 Riverview Drive (all in Perth Amboy). •	Best Presentation: 1st – Paila y Leña Restaurant, 342 Washington Street; 2nd − Torres Café, 431 High Street, and 3rd –Sabor A Mexico fresh Mexican Restaurant, 347 Smith Street (all in Perth Amboy). •	Best Dessert: 1st – Seasons 52 that presented “mini indulgences;” 2nd – Cazadores Restaurant, 236 New Brunswick Avenue, Perth Amboy, and 3rd – Dunkin’ Donuts, representing all four locations in the city. BID is grateful for the key role that was provided by student volunteers and the city’s departments. Volunteers from Perth Amboy High School helped restuarants, bakeries and food artisans by quickly and politely serving guests. The officers from Perth Amboy’s Police Department coordinated parking and managed event security. Materials to keep the space clean and neat were generously supplied by the Department of Public Works.